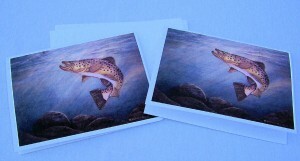 Packet of 5 blank Brown Trout note cards with envelopes. Note cards are 5.5 inches wide by 4.5 inches tall. Brown Trout Blank Notecards and Envelopes. Each pack contains 5 cards and envelopes.